In one of the biggest settlements of its kind to date, U.S. drug giant Pfizer has entered a tentative agreement to pay $784.6 million to settle long-running allegations that drug manufacturer Wyeth overcharged Medicaid for its heartburn medication Protonix. The two whistleblowers who brought the initial claims under the False Claims Act stand to split a whistleblower award of nearly $59 million. Pfizer inherited the Protonix case in 2009 with the purchase of Wyeth, the same year the U.S. Justice Department filed suit against Wyeth. Claims allege that Wyeth violated federal law by providing discounts on Protonix to non-government hospitals while charging Medicaid full price. Federal and state False Claims Acts have a “best price requirement, making it illegal to overcharge federally funded healthcare programs for prescription drugs. Pharmaceutical companies are required to offer their lowest prices to Medicare, Medicaid and other such programs. Protonix acts to repair damage to the lining of the esophagus caused by acid reflux. Though a dozen cheaper pantoprazole generics are on the market today, the claims originate from the years between 2001 and 2006 when Wyeth’s Protonix patent gave it market exclusivity. The Justice Department has estimated the total losses in taxpayer dollars could be in excess of $2 billion. The settlement is not an admission of Wyeth’s liability in this case. According to the Wall Street Journal, a Boston federal court trial is set for March 7. This isn’t the first settlement involving Wyeth and Protonix. Pfizer paid $55 million in December 2012 to settle claims that Wyeth marketed Protonix for off-label uses not approved by the Food and Drug Administration. 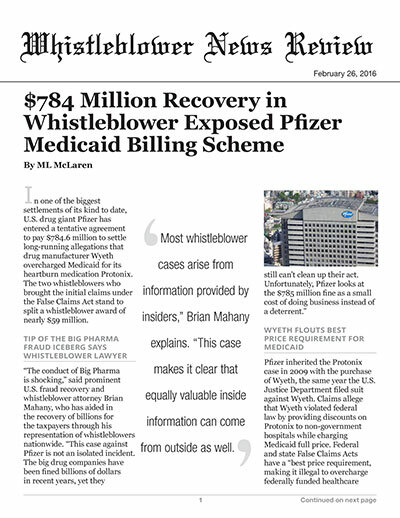 The investigation originated from two whistleblower lawsuits filed against Wyeth by Louisiana physician, Dr. William LaCorte, and a former AstraZeneca sales rep, Lauren Kieff, who stand to collect nearly $59 million for bringing the initial claims against Pfizer. Dr. LaCorte discovered Wyeth’s fraudulent pricing scheme through his New Orleans hospital while Kieff learned of the activity through speaking with hospital pharmacists. Dr. LaCorte previously collected $38 million after filing several similar pharma suits – including the 2008 $250 million Merck settlement regarding the heartburn medication Pepcid. The U.S. Department of Justice continues to fight big pharma fraud with the inside information that often can only come from whistleblower willing to come forward. In 2015 alone, the government recovered $2.8 billion through False Claims Act lawsuits filed by whistleblowers. Those willing to bring fraudulent activities to light can collect up to 30% of the government recovery amount. In 2015, whistleblowers took home $597 million in award money.